The College of the Canyons music department will present its annual POPS! Concert in May, providing local jazz fans an opportunity to hear a new take on some musical classics. The 2012 Jazz Band POPS! Concert will take place at 7:30 p.m. Friday, May 11, on the main stage of the Santa Clarita Performing Arts Center (PAC) at College of the Canyons. General admission tickets are $10 for adults and $5 for COC students and senior citizens. 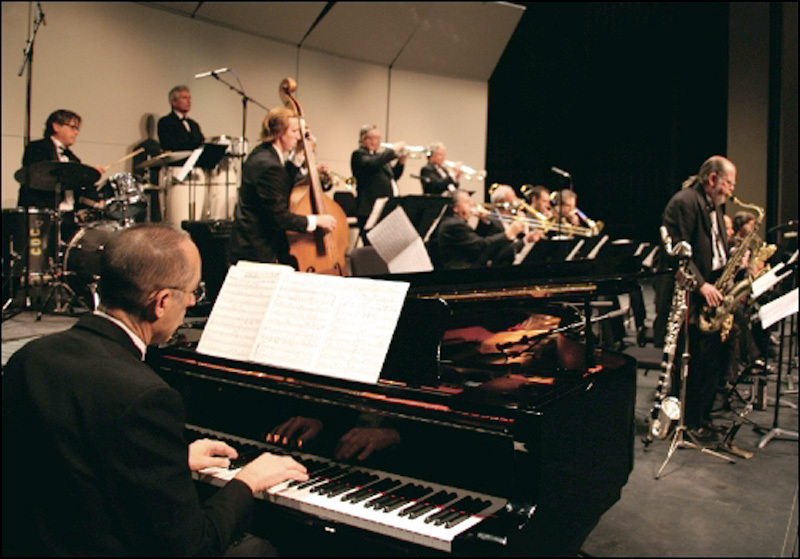 The event will feature a selection of popular music presented by local guest artists and backed up by the award-winning College of the Canyons Studio Jazz Ensemble and Jazz Combo bands, which will perform under the direction of COC music director KC Manji. In all, 35 student musicians will take part in the concert by performing musical arrangements by legendary COC music instructor and jazz musician Dirk Fischer, who began his teaching career at COC in 1977 as the college’s first instructor of jazz studies and director of the college’s jazz band. “Gershwin’s composition of ‘Rhapsody in Blue’ was first premiered by the Paul Whiteman Jazz Orchestra, with Gershwin at the piano, in 1924. At the time the piece was considered a very modern combination of classical and jazz music for a solo piano and jazz band,” said Manji. Other guest artists will include the college’s award-winning vocal jazz choir ‘Just Jazz’ performing under the direction of Julie Lawson, artistic director of the COC choral department. For more information about the Jazz Band POPS! Concert or to purchase tickets, contact the PAC Box Office at 661-362-5304 or visit www.CanyonsPAC.com.